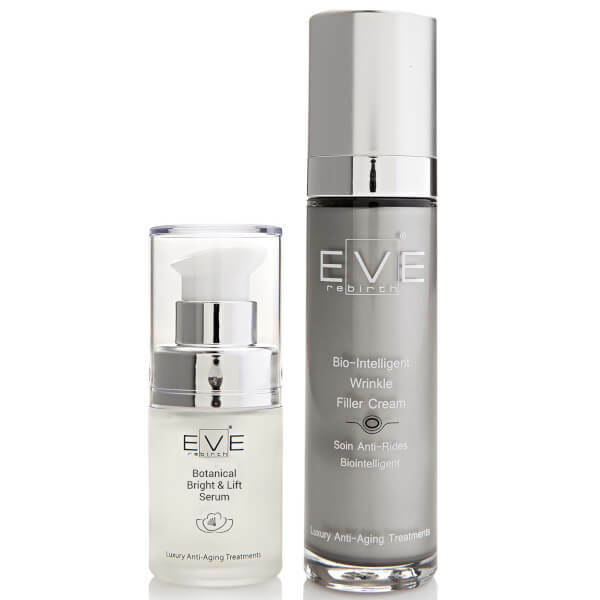 Achieve a younger looking visage with the Eve Rebirth Instant Hyalu-Snake Serum + Bio-Intelligent Wrinkle Filler; a potent duo that target visible signs of ageing. The effective serum works on both the eyes and face, leaving skin smooth and youthful, whilst the wrinkle cream focuses on fine lines and age spots. Used together, the complexion is visibly transformed. Visibly rewind years of ageing with the Instant Hyalu-Snake Serum; a potent anti-wrinkle concentrate that delivers instant and enviable results. The innovative formula utilises Syn-Ake, which mimics the effects of a temple viper’s venom by encouraging muscles to relax. This reveals a smoother visage with a youthful finish. The luxurious anti-ageing serum also boasts a dose of Hyaluronic Acid, which provides a long lasting veil of hydration and has a visible plumping effect. Working on the eye contour, the concentrate is infused with Marine Algae Fucus, which is able to reduce the appearance of dark circles, puffiness and fine lines, whilst Polysaccharides of Cassia Angustifolia ensure the entire complexion is bright and refreshed. Transforming both the face and eyes, the unique serum guarantees to leave skin in optimum condition. Expect the face to appear younger, smoother and ultra-soft. Transform your skin with Bio-Intelligent Wrinkle Filler Cream; an anti-ageing moisturiser that utilises Biointelligent Microingredients to target the source of ageing. 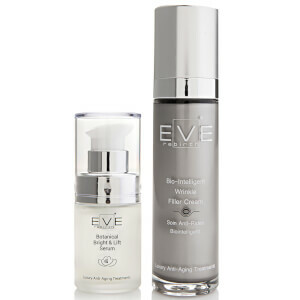 Helping to combat fine lines, wrinkles and age spots, the cream contains dehydrated and cross-linked Hyaluronic Acid microspheres that perform a filling and plumping effect to smoothen the appearance of wrinkles, whilst a combination of Vitamin C and E protect against free radicals and brighten the complexion. Targeting problems at the source, the super-hydrating formula will deliver localised wrinkle treatment beneath the surface whilst firming, rejuvenating and calming the skin. Expect a smoother-looking complexion with diminished age spots, improved tone and boosted moisture and elasticity. Serum: Relax the face and apply the serum. Massage into each area, focusing on fine lines and wrinkles. Leave to absorb for at least three minutes. Moisturiser: Apply a small quantity of product every morning and evening on well cleansed face and neck. Massage with round movements until completely absorbed. Serum: Aqua (Water), Propanediol, Sodium Silicate, Sodium Hyaluronate, Dipeptide Diaminobutyroyl Benzylamide Diacetate, Acetyl Tetrapeptide-15, Palmitoyl Hexapeptide-19, Copper Heptapeptide-14 Pantothenate, Heptapeptide-15 Palmitate, Tilia Tomentosa Extract, Achillea Millefolium Extract, Fucus Vesiculosus Extract, Cassia Angustifolia Seed Polysaccharide, Malus Domestica Fruit Cell Culture Extract, Mannitol, Glycerin, Sodium Citrate, Xanthan Gum, Hydroxyethylcellulose, Dextran, Citric Acid, Tetrasodium Glutamate Diacetate, Lecithin, Caprylyl Glycol, Hexylene Glycol, Lactic Acid/Glycolic Acid Copolymer, Polyvinyl Alcohol, Phenoxyethanol, Ethylhexylglycerin. Wrinkle Filler: Aqua (Water), Propanediol, Polyglyceryl-6 Distearate, Cetyl Palmitate, Glycerin, Coco-Caprylate, Dicaprylyl Carbonate, Ethylhexyl Palmitate, Dimethicone, Cyclopentasiloxane, Polymethylsilsesquioxane, Sodium Hyaluronate, Echinacea Pallida Extract, Achillea Millefolium Extract, Calendula Officinalis Flower Extract, Sodium Ascorbyl Phosphate, Tocopherol, Copper Heptapeptide-14 Pantothenate, Heptapeptide-15 Palmitate, Jojoba Esters, Sorbitan Olivate, Sorbitan Palmitate, Cetyl Alcohol, Polyglyceryl-3 Beeswax, Xanthan Gum, Sodium Stearoyl Glutamate, Sorbitol, Trihydroxystearin, Glucomannan, Dextran, Helianthus Annuus (Sunflower) Seed Oil, Tetrasodium Glutamate Diacetate, Citric Acid, Sodium Polyacrylate, Lecithin, Parfum (Fragrance), Lactic Acid/Glycolic Acid Copolymer, Polyvinyl Alcohol, Polysilicone-11, HDI/Trimethylol Hexyllactone Crosspolymer, Phenoxyethanol, Ethylhexylglycerin.